Where can I find MMD instructions videos? Has MikuMikuDance changed much over the years? What is the VPVP page? The Vocaloid Promotional Video Project page (VPVP) has always been the homepage for the MikuMikuDance program. The VPVP page offers several versions of MMD… including obsolete early developmental versions. The ones WE use today are offered there as sections 1.3 and 1.4… the DirectX Versions. At the foot of that page are links to two basic MMD instructions videos. The first video, with over 675,000 views on YouTube, shows some very basic GUI (graphic user interface) controls and some basic bone motions. The second video,with over 212,000 views on YouTube, shows registering bones and an explanation of animation and using frames to create a motion… with a quick intro to using the interpolation curve. 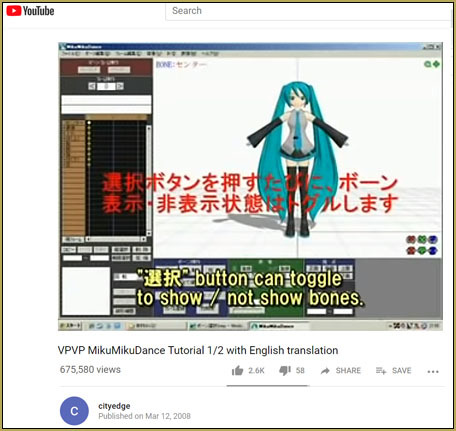 Those videos are old… from 2008… when the first version of MikuMikuDance was developed. Yes: many upgrades and the “new” DirectX technology (with the release of MMD 7.39 in 2010) has changed the look of the MMD GUI and the location of the buttons and menu items… but these videos still offer a nice introduction to the concepts required to create 3D animations with MikuMikuDance. Today, as of February of 2019, we are running MMD 9.31. YouTube and the Deviant Art pages are “littered” with many nice MMD instruction videos… but these two old ones have solid instruction… and with that nice Miku music, they are so pleasant to watch.